Q - What is the difference between the traditional and slimline style of sheath? A - All of our sheaths have universally spaced rivets that can accept a number of different mounting options. This makes your new sheath platform the most modular in existence. Both sheath styles are the same thickness, and are made from the exact same materials. 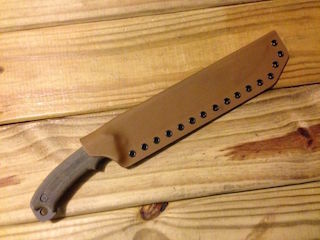 The traditional sheath has mounting on both sides of the blade (front and back). The Slimline style of sheath has this mounting on the blade side only. This makes for a narrower sheath. Depending on need, a Slimline might provide for a smaller carry option because it has the mounting holes only along the blade edge. 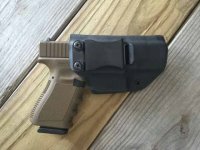 Both styles will accept mounting accessories anywhere along the mounting edge, but the traditional design can do this on either side of the sheath as well (necessary for Molle-Lok). Both styles can be worn right or left handed, inverted, laterally, etc. Examples are shown below.